Heat gas or charcoal grill. Place sausages on grill over medium heat. Cover grill; cook 18 to 20 minutes, turning occasionally, until no longer pink in center. Cool 5 minutes; cut at an angle into 1/4-inch slices. Meanwhile, cut 18x12-inch sheet of heavy-duty foil; place on large cookie sheet. Spray foil with cooking spray. Unroll dough onto foil. Starting at center, press out dough into 14x10-inch rectangle. Spray dough with cooking spray. Turn dough rectangle over directly onto grill rack; peel off foil, and return foil to cookie sheet, sprayed side up. Cook uncovered on gas grill over medium-low heat or on charcoal grill 4 to 6 inches from medium-low coals 2 to 4 minutes or until bottom is golden brown. (Watch carefully to prevent burning.) With wide metal pancake turner, turn crust over. Cook 1 to 2 minutes longer or until bottom is set but not brown. Carefully remove from grill; place browned side up on foil. Close grill. 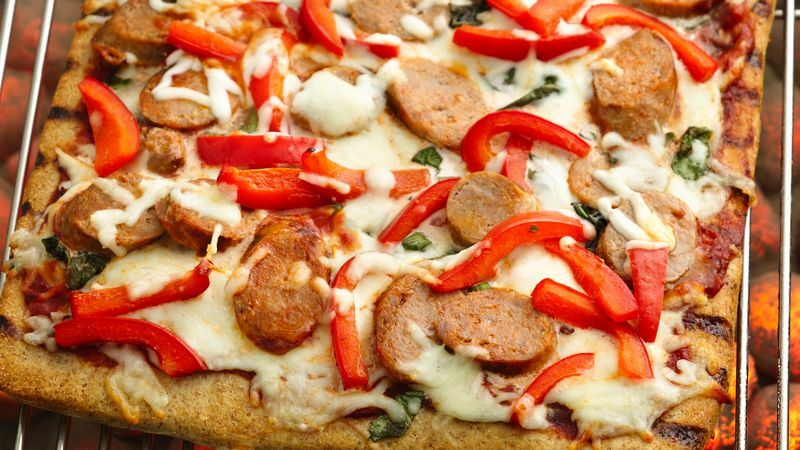 Top crust evenly with pizza sauce, basil, 1 3/4 cups of the cheese, turkey sausages and bell pepper. Top with remaining 1/4 cup cheese. Slide pizza from foil onto grill. Cover grill; cook 3 to 5 minutes longer or until crust is golden brown and cheese is melted. To serve, cut into 6 rows by 3 rows. Have all toppings ready to go--the crust cooks quickly. If the crust is cooking too fast, move the pizza to a cooler part of the grill, or reduce the heat. Don't want to grill? Bake the pizza in the oven following the crust directions on the can that use a prebake time.